Ironic or convenient, our review comes out the day Sony announced putting the Xperia Tablet S on hold over manufacturing faults. Essentially, the splash resistance is compromised and a recall is under way, meaning Sony already has a solution to the problem. If nothing else, this gives you some extra time to consider your options and our take on the Tablet S may help as well. The Sony Xperia Tablet S is a big improvement over the original and as an overall package, a very nice Android tablet. We still get the feeling that it's intended mostly as a stay-home tablet with all that IR remote functionality, the fold trading thickness for comfort and the Guest mode feature that lets the entire family share the tablet, each getting their own homescreen (and perhaps restrictions). Still, it's 11.9mm at its thickest and 8.8mm the rest of the way and with the QWERTY keyboard cover, the Xperia Tablet S might actually compete for the interest of road warriors. The aluminum back and splash-proof design certainly are a plus, though we really would have liked a 1080p (or WUXGA) option for the screen. Tegra 3 is more or less on par with the droid tablet competition and while the Tablet S doesn't run Jelly Bean yet, Sony's additions to the software are well appreciated. Unfortunately for the Sony Xperia Tablet S, there are plenty of competing Android tablets in this same segment and with the market still not caring much for droid tablets we are not sure there will be enough room for everyone. As we see it, the Tablet S main rival is going to be the Asus Transformer Pad TF300T. It costs around the same as the Tablet S and there's the option to buy a keyboard dock that turns it into a sort of netbook while also adding more battery life (Sony's QWERTY cover can't be tilted at any angle you like, nor does it have a battery in it). If you'd like a screen upgrade to 1080p, we urge you to consider the Acer Iconia Tab A700. Sporting a Full HD LCD, a Tegra 3 chipset and an ampler battery, that one retails for just a fraction more than the Xperia Tablet S. It doesn't have as interesting design, but it still seems to provide more back for your buck than the Sony slate. If must absolutely keep within the Xperia Tablet S budget, then Acer still has you covered with the A510. That one has a huge 9800 mAh battery working in its favor too. When it comes to price though, it's hard to beat the brand new Barnes&Noble Nook HD+. It has a 9" IPS LCD screen of 1920 x 1280 resolution and a dual-core CPU. It comes with 16GB of built-in storage at just $269 (or 32GB for $30 more) and it has a microSD card slot. Best of all, it's running Android 4.0 with a custom launcher rather than a heavily customized version of the OS. If you are willing to trade some Android feature for easy access to Amazon's vast multimedia library, you can also take a look at the Amazon Kindle Fire HD 8.9". It uses the same TI OMAP 4470 chipset as the Nook, but it's screen has "only" 1080p resolution and costs $299 for the 16GB version (no microSD card slot there either). Both tablets have HDMI out but no Bluetooth, GPS or main camera (the Fire HD at least has a front cam). Keep in mind that neither of those has access to Android's official app repository - the Play Store, so the selection of apps they get is pretty limited. Or at least until the good guys over at XDA-developers do their magic and enable it. Finally, there's the Google Nexus 7 tablet priced at just $199 (with 8GB of storage). We wouldn't normally mention a 7" tablet as an alternative to a 10-or-so incher, but this is pure Google, so we're making an exception. It runs the latest Android version and will enjoy fast-lane updates, but you have no microSD card slot, HDMI TV-Out, main camera and so on (there is Bluetooth and GPS connectivity though). 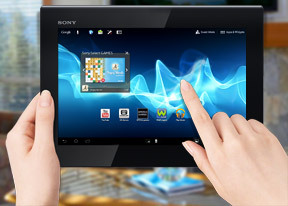 The Sony Xperia Tablet S is fairly unique in design and features, but established competitors and relative newcomers like Barnes&Noble are providing excellent products of their own at very competitive price points. So, while the Xperia Tablet S might be a good companion to your other Sony gadgets, it probably won't be the Android tablet that makes it big.